White teeth definitely give you the confidence you need to smile without having to worry about your teeth; they let you have a good laugh without having to cover your mouth. Whether you are an avid coffee drinker or have been negligent in brushing your teeth properly, your teeth might become taken on a shade of yellow. But the good news is that you don’t have to go to the dentist and empty your wallet to get whitening procedures because there are many types of teeth whitening products that are guaranteed to give you that white smile. To make life a lot easier, we have shortlisted the best teeth whitening procedures that will leave stunning results. The strip, especially those for the lower set of teeth are short and do not extend all the way to the molars. 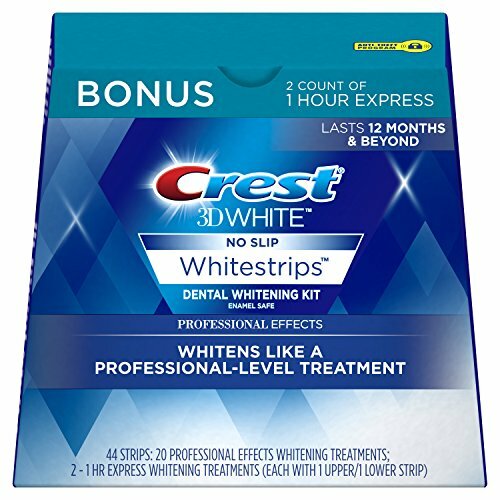 Crest has other products that have longer strips. Some customers say that teeth hurt the day after strips are used, especially if you have sensitive teeth. Using toothpaste for sensitive teeth helps. This pack of 14 whitening strips is one that is backed by an excellent rating and positive customer reviews. There are several features of this product that make it an amazing buy. Firstly, these are the only whitening strips that are ADA (American Dental Association) approved, so you do not have to worry about them hurting your teeth. The ingredients of the product are also transparently mentioned, and the product claims these are the same ingredients that the dentist uses in whitening procedures. The whitening strips guarantee to remove 10 years of stains; indeed pictures shared by customers of their teeth before an after using the whitening strips show a very noticeable difference. The whitening strips are easy to use, you have to peel their covering, place it on your teeth firmly- the strips mold to the shape of your teeth, keep them on for 30 minutes and then remove them. Their firm grip allows you to talk and drink water while having them on. You can use these strips once daily, and moderate how often you use them depending on your teeth. The effect of these strips last 6 months. 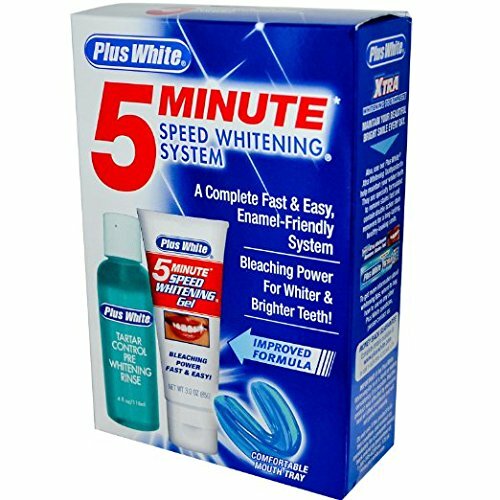 This whitening kit by Plus White includes a whitening gel, a teeth tray, and a tartar-control whitening rinse. To use this product, you have to follow the directions on the pack and mix the gel with water according to the ratio instructed and use the tray to keep it in contact with your teeth and rinse. This product has mixed reviews, most customers claim that they see a visible whitening effect on their teeth but have to follow the instructions to the word for these results. Many customers also find the tray unfitting and have to hold it in place themselves. Although this product is not ADA approved, the manufacturer does clearly state the ingredients used. The best feature about this product is that it is cheap and offers a good value for money. These whitening kits from Go Smile employ another mechanism and application procedures, differing from strips and gels. The most attractive feature about this product is that it is easy to use, all that you have to do is snap one of the capsules and apply the contents on your teeth. Two capsules are to be used each day, after brushing at morning and at night. Since 14 capsules are included in this pack, the product claims to show visible effects in just 7 days, which is excellent for people who want a quick fix. However, the rating and customer reviews for this product are not impressive. Many customers say that the capsules only provide a boost and the effect is not as evident as marketed. However, this may be indicative of the fact that they are not as harsh on the teeth. The capsules are designed in a way in which some of its contents are difficult to get out. With a high price, in comparison to similar products, the saving grace of this whitening system is its easy application. This is by far the easiest product to use because it integrates brushing and whitening together and no extra effort has to be made, just brush as usual. These strips have their whitening formula embedded in the strips. To apply, you have to peel off individual strips and stick them to your teeth. Good quality strips will adhere to teeth sufficiently. Strips usually have to be kept on for an average of 30 mins. For these types of products to work, your teeth have to be immersed in the gel, for which a tray in which your teeth are fixed is included. This includes a gel, and a tray which is fixed on the teeth and a LED light attached to the tray is turned on. Individual capsules can be broken off, and the contents can be applied to your teeth, usually to be used twice daily. The mechanism of these is essentially the same as that of whitening capsules, the difference being that the product only comprises of a single brush, which can be twisted to expel new content each time. Most often purchased under this category, is activated charcoal powder. This powder is brushed onto teeth with a regular brush and then rinsed. If you have braces, products such as whitening strips will not adhere to your teeth. A tray might also not fit your teeth perfectly, and you may have to hold it in place, this is only worth it if the product whitens your teeth very well. If you want to have whiter teeth for an upcoming event, look for products that promise quick whitening or which provide immediate whitening, although the effects may not last as long. You may not have the time to leave trays in your mouth or keep a product applied for a more extended period of time, in this case, use products that are quick and convenient to use. If your teeth are very sensitive, make sure you use a product for which customer reviews confirm that it does not hurt your teeth. If you can buy a product that is ADA approved, then there’s nothing like it. Some products are more expensive than others, and not necessarily because they are better. If you want to make sure your money doesn’t go to waste, try buying a smaller or one-time pack of the same product to test it first. Moreover, some products work for some people and not for others, especially when it comes to beauty and wellness related ones. A whiter smile can be a boost to confidence for many, and it’s great that you don’t have to spend a ton at the dentist for it.